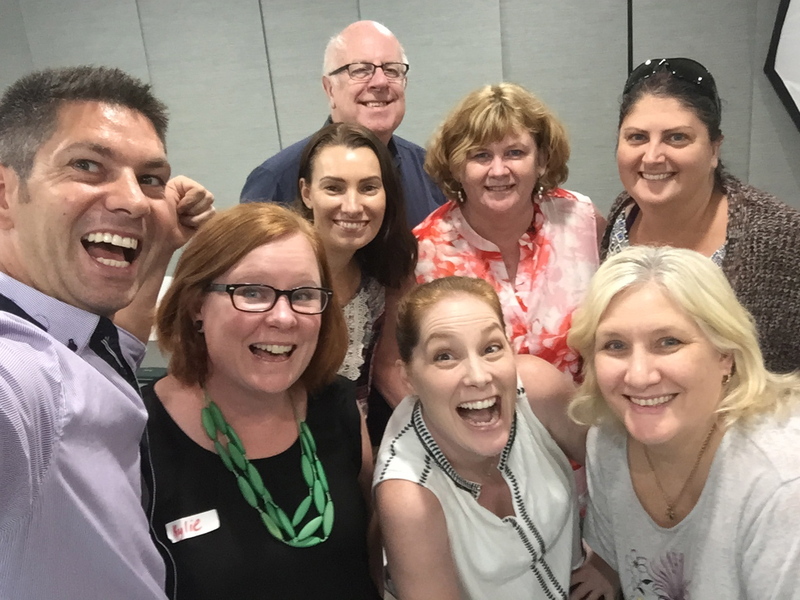 The Master your Marketing workshops have seen some huge success stories come out from them since we have been running them over the past 6 months. 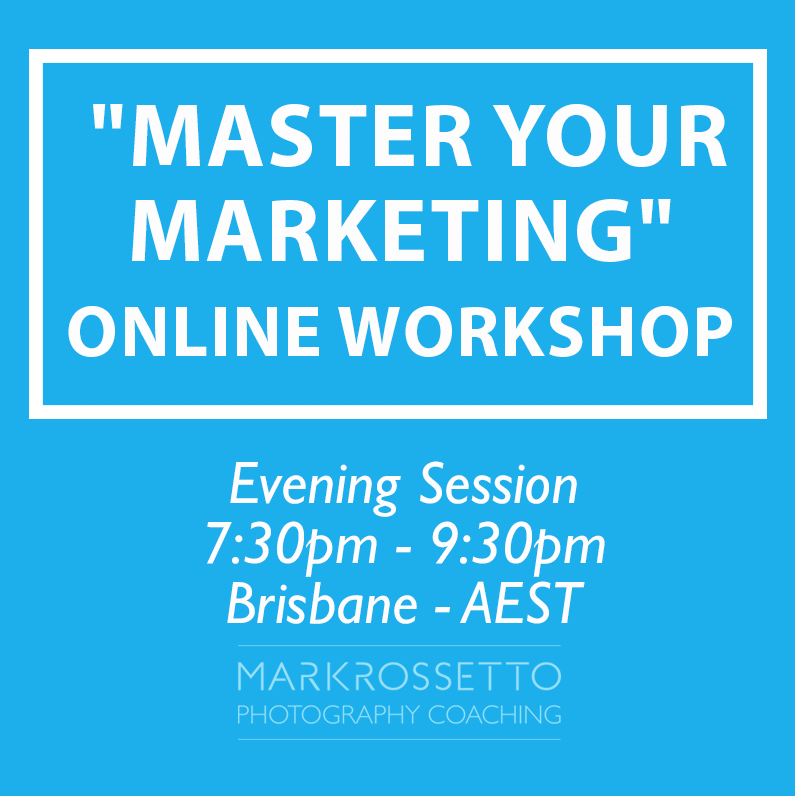 With sold out workshops in Brisbane, Melbourne, Sydney, ACT, Adelaide and both online course. 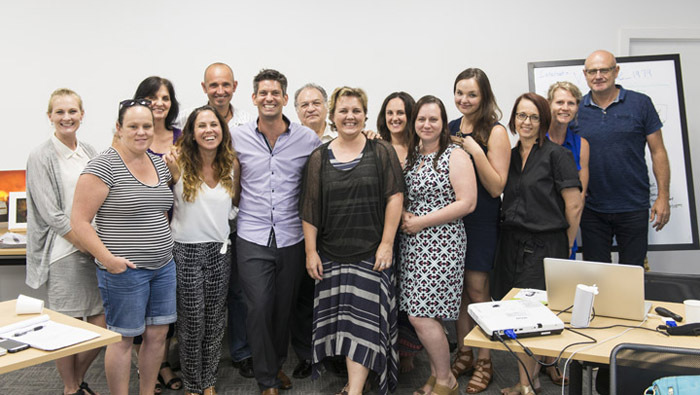 People have been asking me to do the “Master your Marketing workshop” all over AUS, NZ, USA and UK. Mark just can’t reach everyone. So we have decided to do is the workshop online! This way everyone has the opportunity to do the course and grow their business from their own home/studio anywhere in the world. This is the workshop you have been waiting for! 4 x 2hour sessions Face to face group training online via zoom meetings. It’s a total of 8 hours of pure photography marketing, all designed to get your phone ringing with qualified and quality leads, who are excited about you and your photography business. This is all achieved through great client education, understanding the psychology of sales, client buying cycles and giving the right information at the right time. We will go through marketing ideas and you’ll walk away with a 12 month marketing plan to set yourself up for 2019 and beyond! 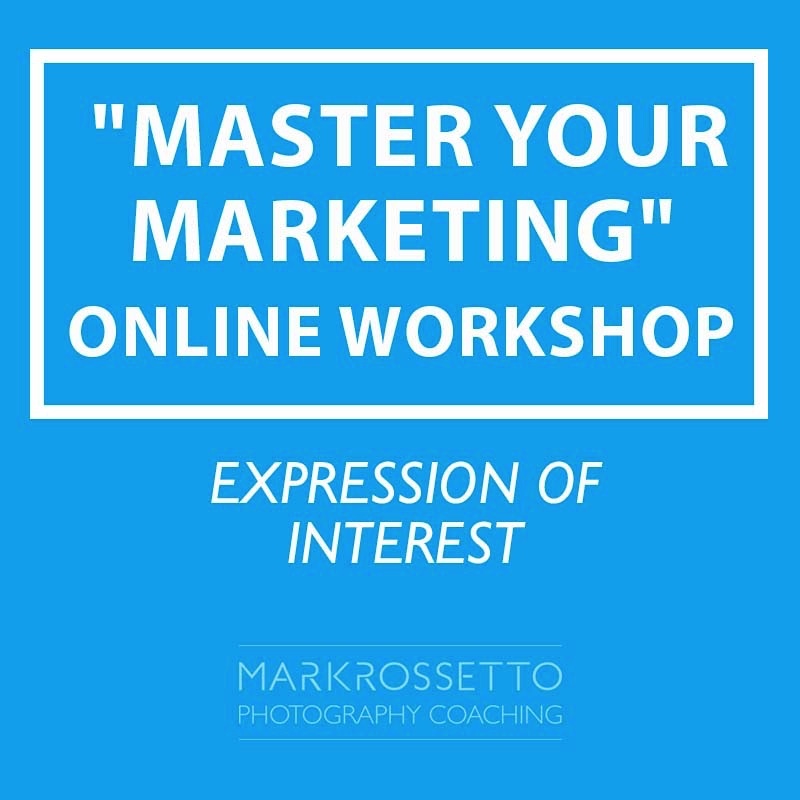 This online workshop will be presented by Master Photographer and Business Coach, Mark Rossetto. Mark built and ran one of Melbourne’s most successful portrait studios, photographing approximately 500 clients per year. This practical, content-packed workshop is designed for any photography business professional in any genre, style and location around the world. The marketing techniques and psychology of sales are tested and proven over 10 years. They are transparent, honest and are all customer focused to increase client education and to give you great quality leads, not just numbers and empty enquiries. Using the genre and style you already have, you will learn the art of client education from the first phone call all the way to ordering the artwork. Increase your average orders and have a greater consistency and predictability in your photography studio. Mark’s Top 10 Marketing blueprints. Each marketing strategy has a step by step guide that covers EVERYTHING you need to know about how to execute that strategy. Including FB Marketing…… Just this alone is what some courses cost $3000 for this info. I’m going to blow your mind onto how many opportunities there are out there to go to market. It’s an endless supply of ideas. How to create and understand your 12 month Marketing plan for 2018 and beyond! 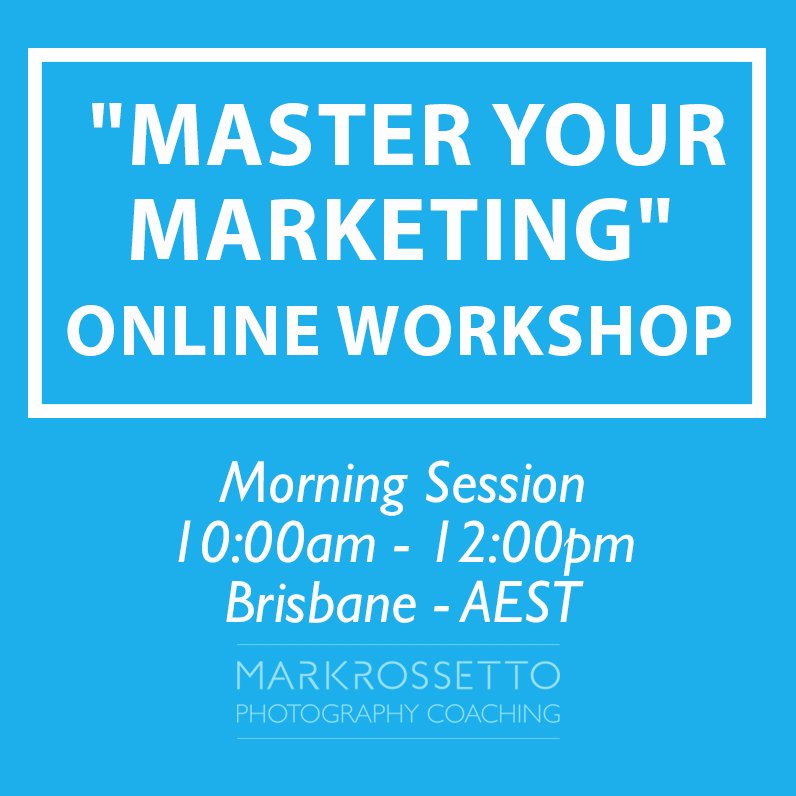 ​Please note: This workshop is 100% marketing related, without any fluff. 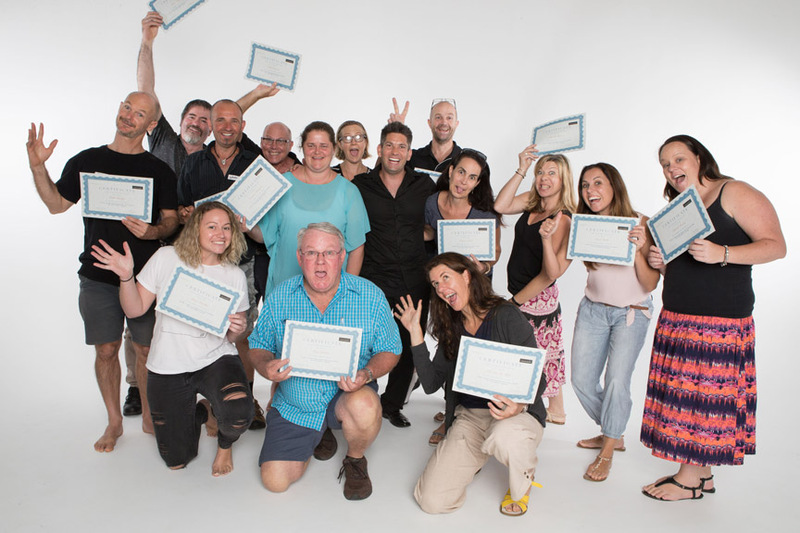 You’ll be learning methods to set your business and marketing up for the greatest chance to be a successful photography studio. PayPal: Click on the session you would like to attend on the links above. This will take you to the online store. Pay in full or a minimum 50% deposit is required to confirm your booking. Remainder 50% is due 14 days prior to workshop (50% payment coupon code is “mrw2018” – type in at payment gateway through PayPal). Direct Transfer: Pay in full or a minimum 50% deposit is required to confirm your booking. Remainder 50% due 14 days prior to workshop. Attendees: Workshops will be limited numbers to only 10 attendees. How to attend the ZOOM call. ​Testimonials – Read what others say about Marks coaching and workshops.